Kuala Lumpur tower is the landmark of Kuala Lumpur, erected as tallest building in Malaysia and give a bird eye view over the city. 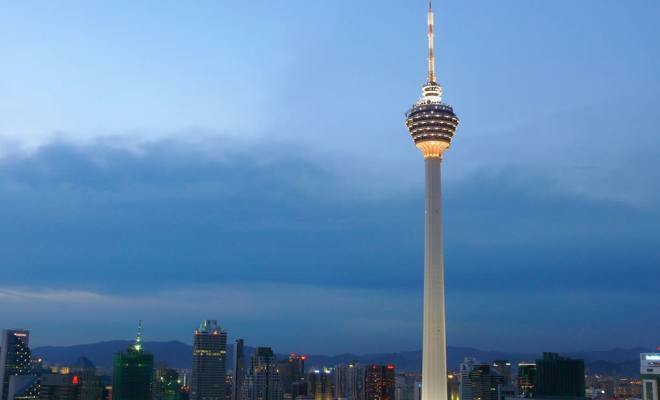 Kuala Lumpur Tower is built for telecommunication and broadcasting purposes, but is now an enduring place for tourists. It lures almost 100,000 visitors per year and the building is 421 meters measured from the ground to its top of antenna. Besides its official communication function, the building is also served as the annual crescent moon observatory for Islamic falak to mark the date of first day of fasting and Hari Raya Aidilfitri, and also Hari Raya Aidiladha. Take a closer look surround the building on the abstract and classic Islamic floral motives, color combination, it resembles the Islamic design. To be precise, the building is divided into five sections: Starting from the bottom, the three floors basement is used for storage and maintenance. Followed by administration offices, 146 meters mall of mini artificial waterfall. At here, visitors may want to preview documentary on tower construction at its mini-theater. The open amphitheater has 222 seats and will screen the show at every 15 minutes. The third section, which is the shaft with 22 levels, has 2,058 steps. This site has become annual sport event in climbing the stairwell. Remember the reality show; ‘the Amazing Race Asia1’ had made this place as its pit stop. Tower head, at the height of 276 metres is the platform for public observation deck. A visitor has to pay RM8 at the tower entrance and got up here through a ‘speedy elevator’. There will be an audio guidance from a device at that place, to explain on your observation. Expect to see Genting Highlands and the view of Klang Valley. Not forget to mention that the telecommunication and broadcast station is also at this section. Another amusing fact about this tower is the revolving restaurant named Seri Angkasa Berputar at the second level of tower head. Visitors not only being able to enjoy the panoramic view over the city, but also getting the chance to see it in 360 degree rotation. During the peak holiday seasons, this is a famous destination for children as well as the locals, so, advance booking is recommended to avoid disappointment.